Ben Hogan, one of the greatest golfers in the history of the sport, believed that any golfer with average coordination can learn to break 80 - if they apply themselves patiently and intelligently. With the techniques revealed in this classic book, you can learn how to make your game work from tee to green, step-by-step and stroke-by-stroke. In each chapter a different tested fundamental is explained and demonstrated with clear illustrations, as though Hogan were giving you a personal lesson with the same skill and precision that made him a legend. 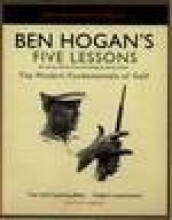 Whether you're a novice player or an experienced pro, BEN HOGAN'S FIVE LESSONS is a must-have reference for anyone who knows that fundamentals are where champions begin.